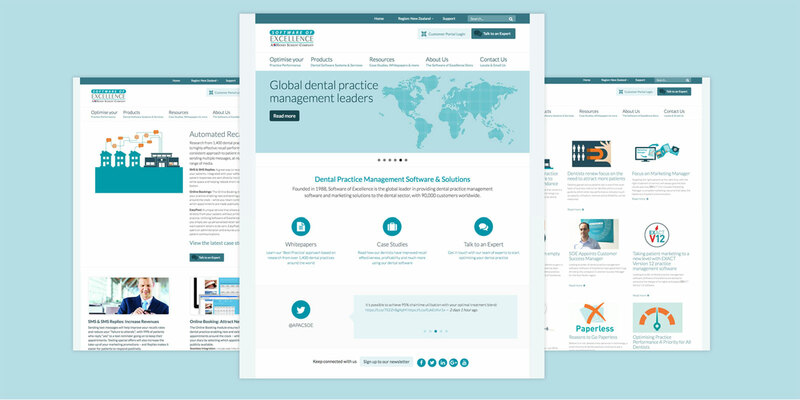 Software of Excellence (SOE) develop dental practice management and imaging software that enables dentists to focus on providing the best possible dental experience for their patients - without having to worry about the day to day management of their practice. We worked with SOE to create a multi-regional, responsive site to showcase their software to the world. Software of Excellence wanted to provide the best experience possible for their customers depending on where they were visiting the site from. This was done through a complete redesign of the website to improve the customer experience and increase conversion channels by delivering relevant content depending on the region selected. We worked with SOE to create an innovative customer support portal for users of their product to interact with instead of direct calling. This allowed SOE to make huge efficiency gains as a global organisation, reducing pressures on their support team and servicing dental surgeries worldwide from one source. What started out as a New Zealand focussed solution has now been rolled out internationally by SOE due to the immediate results they achieved.